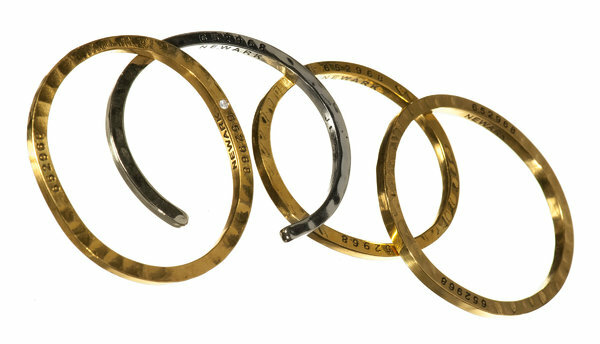 Bracelets from the “Caliber Collection.” The Caliber Collection is made up of metal from 250 guns and bullet casings seized by the Newark Police Department. The first gun turned in at the Calvary Gospel Church, in Newark’s tough South Ward, was an old shotgun. It wasn’t sawed off, and it wasn’t semiautomatic. It was made for hunting. The person who brought it in was paid $150. It was early Friday morning, the start of a two-day gun buyback being held in Essex County, at sites in Montclair, Newark and elsewhere. A few weeks ago, when a gun buyback was held in Mercer County (which includes Trenton), 2,604 guns were turned in, 700 of which were either illegally bought or illegally modified. Among the guns turned in was a rocket launcher. Things were slow at Calvary Gospel. Though other sites, especially Montclair, were buzzing with activity, the dozen-plus Newark policemen in the Calvary Gospel gym were mostly killing time. Every so often, an officer would yell, “Incoming,” meaning that someone was bringing in a gun. The police would snap to attention. Most of the gun sellers looked embarrassed. “This is awkward,” said a man turning in three guns, one of them an assault weapon. A Newark police veteran later told me that he and his team could often trace a gun bought at a buyback to a particular crime or a particular dealer in the South, where many of New Jersey’s illegal guns come from. But, because the gun buyback came with guaranteed amnesty, they couldn’t pursue it any further. I tried to talk to some of the gun sellers as they were leaving, but most of them just looked straight ahead and kept walking. By 10 a.m., about 20 guns had been turned in, including a half-dozen semiautomatic pistols. Just then, Jeffrey Chiesa, New Jersey’s attorney general, and Carolyn Murray, the acting Essex County prosecutor, walked in. They were providing the cash being used to pay for the guns with money confiscated from drug busts and other crimes. (The sellers got paid on a sliding scale: from $25 for a BB gun up to $250 for an illegal weapon.) Chiesa made a point of thanking the pastor, the Rev. Steven Davis. “It’s important that people turn guns in at places they can trust,” he said. There are plenty of critics of gun buybacks. They argue that people turn in guns that would never be used in a crime — like that hunting gun I saw early on. They say that criminals are hardly going to be tempted to hand over their guns because someone is waving a few hundreds dollars at them. But Chiesa wasn’t buying it. “The governor,” he said, referring to Chris Christie, “has told us to use every means necessary to reduce gun violence, traditional and nontraditional. We have collected a lot of guns in these buybacks, many of which were acquired illegally. Anecdotally, we know it makes a difference.” Later, over the phone, Mayor Cory Booker of Newark told me that while he had been skeptical of buybacks before he took office, he was now a true believer. “I have seen the kind of weapons turned in, and I know we are preventing some gun violence,” he said. Chiesa went to another Newark site, the Paradise Baptist Church, where he held a brief news conference. “What are you going to do with the guns?” a reporter asked him. “We will destroy them,” Chiesa said. It’s actually a little more interesting than that. Shortly before noon, a woman named Jessica Mindich walked into Cavalry Gospel, accompanied by Sgt. Luke Laterza, a Newark ballistics officer. A striking, 42-year-old mother of two from upscale Connecticut, she was going to be the recipient of the guns bought during the buyback. Mindich runs Jewelry For a Cause, a company that designs jewelry tailored for specific philanthropies. In December 2011, she heard Booker speak so movingly about the devastation caused by urban gun violence, that she came up with the idea of designing bracelets made from melted down guns. Around 7:30 p.m., I heard from the attorney general’s office that the gun buyback would acquire 1,000 guns on Friday alone. Montclair was such a hotbed of gun selling, that the Newark police had decided to send some officers there to help out on Saturday.